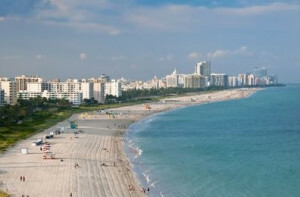 When the world thinks of Miami, one of the first images that come to mind is that of the iconic Miami Beach. With its famed art deco, white sandy beaches, trendy nightlife, and posh amenities, the city has every right to its claim to fame. When Miami Beach was first incorporated as a city on March 26, 1915, its residents experienced a much different lifestyle than what we know today. As it has evolved, the single-family residences on Ocean Drive and Collins Avenue were replaced with hotels, restaurants, and shops. From the charisma of South Beach to the charm of North Miami Beach and Bal Harbour, Miami’s beach areas are just as alluring as ever. Picturesque ocean views, sandy white beaches, museums, art centers, delectable dining, and high-class shopping, are all part of the Miami Beach lifestyle. It’s no wonder that just over 91,000 people call Miami Beach their home. Whether Miami Beach is your primary residence, your second home, or where you choose to purchase investment properties, there’s something for every buyer. With its vast array of single-family homes and condominium towers, there is a property to fit most every need with architecture and amenities that cater to the most discerning tastes.